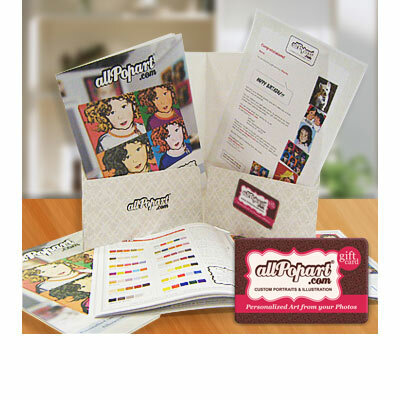 The All Pop Art gift card provides you with great value! Save 5% for up to $100, 10% up to $450 and 15% for $500 and up! If you don't see the amount you wish to purchase, please contact us. Get the allPopart Gift Card and we will FedEx a well presented folder with our exclusive catalog and a credit card look alike gift card which can be redeemed online for its face value, which runs from $50 to $1000. 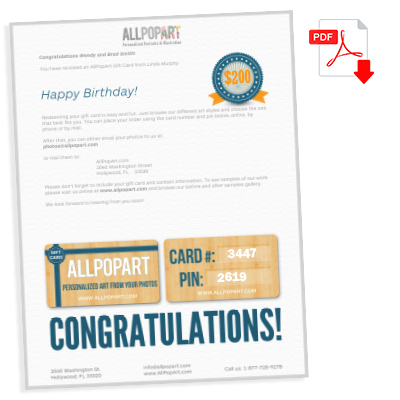 The All Pop Art gift card provides you with great value! Save 5% for up to $100, 10% up to $450 and 15% for $500 and up! So you actually pay less than the full gift card amount - Just our way to help you wow your friends with a great gift. A personal note from you will be included too. What's more, the allPopart Gift Card never expires. If time is running out or if you don't want to pay for rush shipping, we will email you within hours our unique allPopart PDF Email Gift Card, which looks just like the real one. You can select this option or different shipping options at checkout. (allPopart gift cards are not refundable/redeemable for cash) *Discount coupons and special offers cannot be applied to gift card purchases. GUARANTEED PREMIUM QUALITY: Our personalized portraits are expertly crafted and lifetime-guaranteed to last. All the hanging hardware is included with your portrait, so your gift will arrive ready to hang and to impress for life. OUR MATERIALS: The canvas of our personalized prints is the highest quality available in the US, museum-grade, 100% cotton canvas with a satin finish and invisible UV proof filters. Its waterfastness eliminates the need for spray or harmful varnish overcoats. 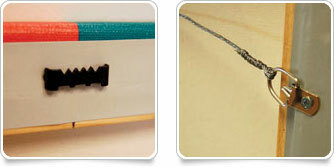 Its double-weave allows for better framing without edge cracking. Our archival fine art luster paper offers high definition, brilliant color and saturation. All our materials are 100% acid free for archivability and water resistant. SUSTAINABLE GIFTS: We design, print and frame our eco-friendly professional-finish portraits and gifts fully in our premises while complying with sustainable production guidelines. FAMILY FRIENDLY: Keeping in mind that most of our portraits are gifts for kids and babies rooms, we guarantee they are 100% free of harmful materials. Once your order is placed you can always tell us which colors you want us to use. You can even send us a photo of the room where you plan to hang it or even samples of the wall paint or upholstery fabric, so we can match the colors (our exact color matching service is provided for an additional fee). 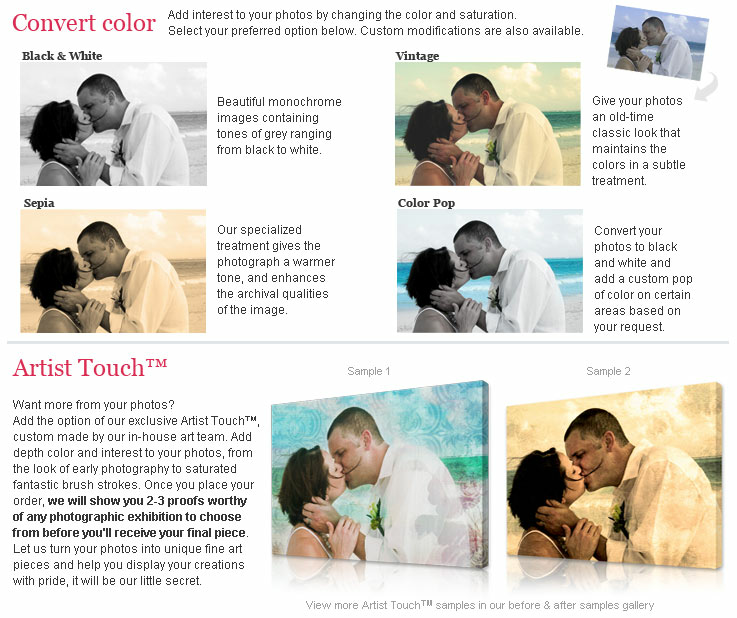 Otherwise, we will choose the colors for you that we think match better the photograph you sent to us. You will receive a preview of the design via email before we send it out, to make sure you are satisfied with the colors. We can revise the colors of your proof at no additional charge as part of our service.